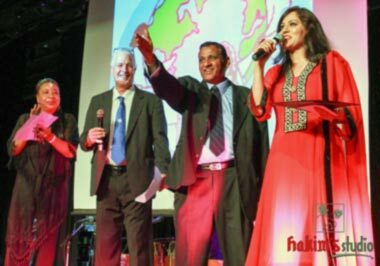 Atlanta's dream of becoming a beacon of peace was propelled forward on May 23, 2014 with the visit of international Sufi recording group Fareed Ayaz, Abu Muhammad Qawwal, and Brothers. They performed for "An Eve of Global Music" fundraising event in Berkmar High School auditorium, Lilburn, Georgia, to benefit the envisioned Global Peace Museum (GPM) slated to be Atlanta’s newest international tourist destination. Emcee Shaveta Jain, social activist and former Mrs. India International, created the agenda and led the production. With professional poise, verve, and beautiful dress, she first introduced Ms. Terry L. Hester, event organizer. Terry is a former VP for Atlanta: City of Peace, Inc. (ACP), and is Founder and CEO for “Unity in the Community” campaigns (UITC), which brings multiculturals together to form bonds of peace. Ms. Hester read a letter from Clarkston Mayor Ted Terry, stating, “I would like to recognize and thank these international recording artists Mr. Ayaz and Mr. Muhammad for their service of creating ‘unity within our community’ through their beautiful art of music… Thank you for being Global Ambassadors for Peace!” Dr. Hari Dayal, the band’s USA promoter, also read a proclamation from Atlanta City Council member Kwanza Hall. 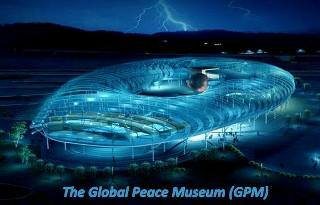 GPM Founder John R. Naugle invited everyone to become cocreators and ambassadors of the Global Peace Museum, which “celebrates the goodness of our global family." The GPM will be developed next to “ATL,” the world’s busiest airport, and the Georgia International Convention Center. It will promote “Tourism: The World's Biggest Peace Industry.” The GPM vision is to propel Atlanta's global peace legacy and help it to eventually become formalized as a global capital of peace so it may inspire our global family. Aslam Pervez inspired the audience with a beautiful panegyric in his native language, celebrating the widely respected artistic talents of the featured international stars, Fareed Ayaz and Abu Muhammad. The ensemble commenced singing, and the auditorium became quiet. The hypnotic and elevating music transported the audience—an indescribable bliss to be experienced, with positive vibes enveloping all. Their seamless switch from one language to another elicited huge applause. They performed beautifully and powerfully, about 11 songs in almost 3 hours. Two stars were accompanied by seven other musicians: Ghulam Akram, Ghayoor Ahmed, Moiz Uddin, Mubark Hassan, Hamza Khan, Tahseen Fawad, and Mustafa Khan (four of whom are sons of Fareed Ayaz). Instruments included two harmoniums, one dholak, one electric ragini, and one tabla. According to Dr. Scott Kugle, Emory University Associate Professor of South Asian and Islamic Studies, “The artists, Fareed Ayaz and Abu Muhammad and party, are among the best singers of our era…. Their late father, Munshi Raziuddin, was a wonderful artist and much-recorded singer. They … are descended from the very first qawwals of Nizamuddin Awliya in Delhi, over 700 years ago. Fareed Ayaz is an extremely knowledgeable person about Sufism and music. For those who love qawwali, this was a rare opportunity."